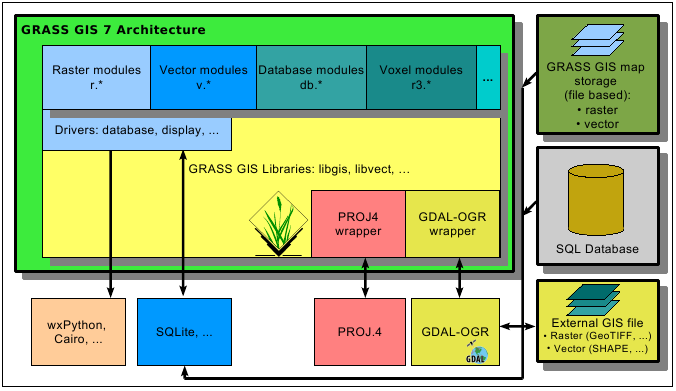 GRASS GIS, commonly referred to as GRASS (Geographic Resources Analysis Support System), is a free and open source Geographic Information System (GIS) software suite used for geospatial data management and analysis, image processing, graphics and maps production, spatial modeling, and visualization. 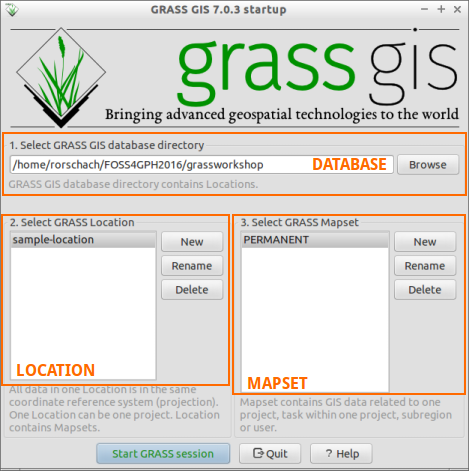 GRASS GIS is currently used in academic and commercial settings around the world, as well as by many governmental agencies and environmental consulting companies. It is a founding member of the Open Source Geospatial Foundation (OSGeo). It is the granddaddy of most open-source and modern-day GIS with its history dating back to its development by the U.S. Army Construction Engineering Research Laboratories (CERL) way back in 1982. Common misconception that it is NOT user-friendly. A LOCATION is some geographic extent of interest that contains data sets that must all be in the same coordinate system. Every location has a PERMANENT directory which stores some basic information about the whole location, and is a good place to park base files. You can think of a location as a data library for a region of interest defined by a coordinate reference system. Every GRASS session runs under the name of a MAPSET. A MAPSET may be a geographical or thematic subset of the parent LOCATION. Technically they are subdirectories under any location. 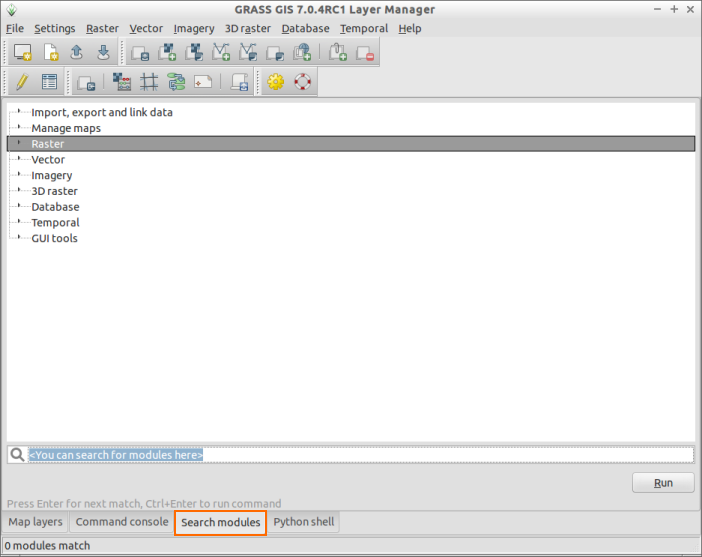 Users may only select (and thus modify) a mapset that they own (i.e., have created). However, data in all mapsets for a given location can be read by anyone (unless prevented by UNIX file permissions). 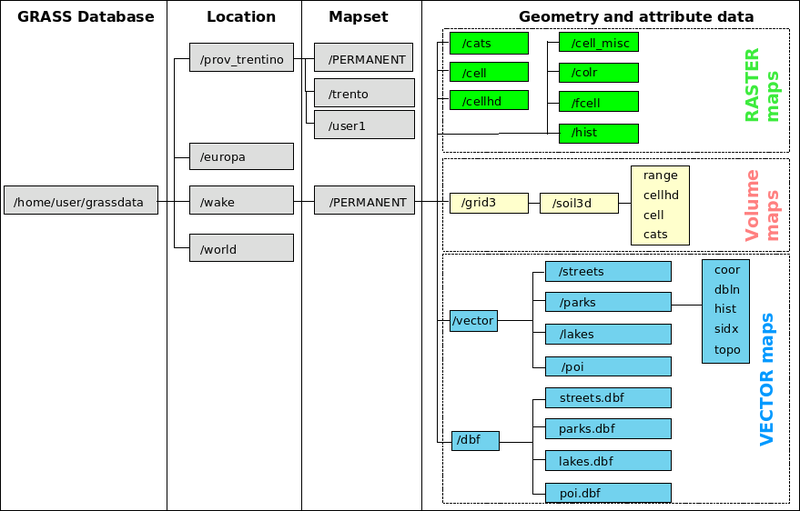 The "PERMANENT" mapset usually contains the read-only base maps like the elevation model, while the other locations are readable and writable by their owners. The "PERMANENT" mapset also contains some information about the location itself that is not found in other mapsets (projection info etc. ), thus it must exist in every location. 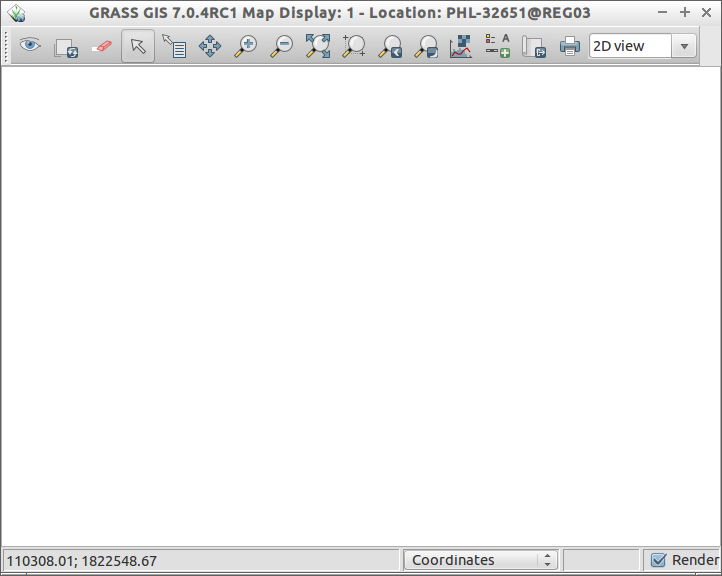 Raster maps are always imported completely at their own resolution (exception: WMS imported layers). Vector maps are always imported completely. 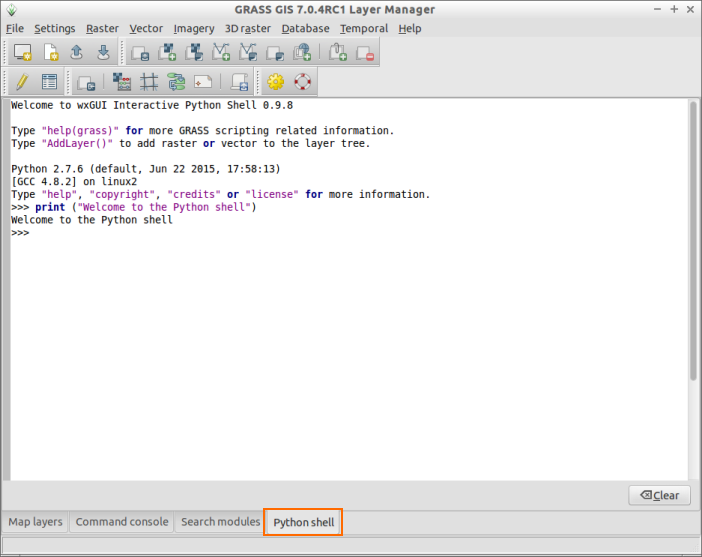 Raster input maps are automatically cropped/padded and rescaled (using nearest neighbour resampling) to match the current region in order to produce the output raster map or to query values. 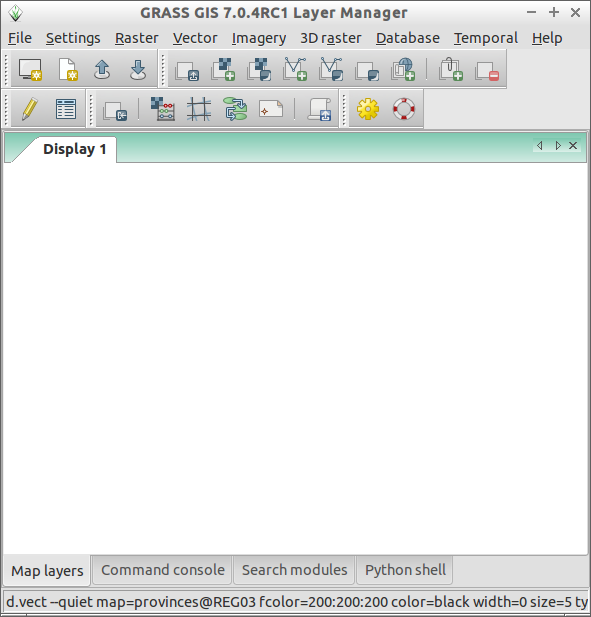 Raster output maps have their bounds and resolution equal to those of the current computational region. Vector maps are always considered completely. 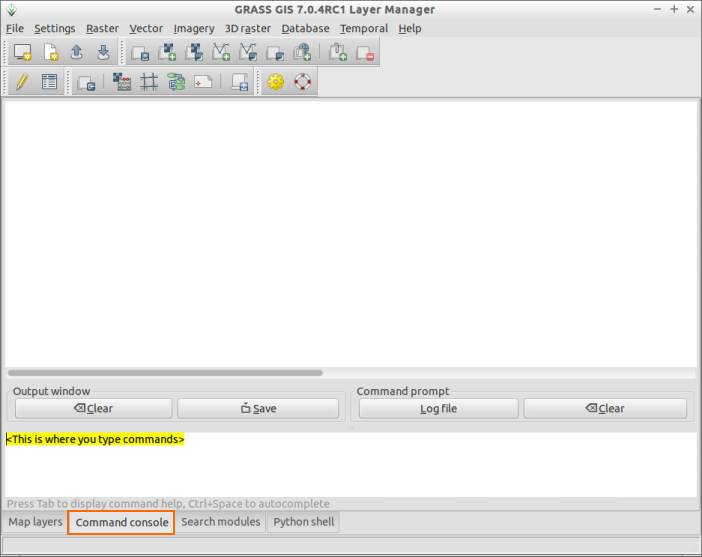 The other window is the Map Display which displays the layers in the Layer Manager.